I Love Gamefly. I’m a level 3 member, which means I’ve been with them for over a year and get 10% off purchases and 5 Gamefly dollars every 3 months. It’s on one hand a great video game rental service but I also love having the option of keeping the games I am renting at prices nothing short of amazing. Take a game like “Eternal Sonata” for the 360 for example: $54.99 used at Gamestop, $29.69 at Gamefly! 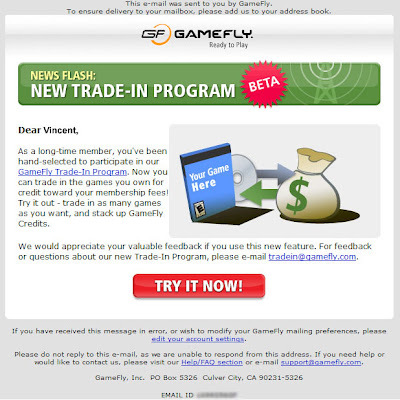 When I received an email from them on Tuesday inviting me to Beta test their new trade-in program, I had mixed feelings because although it seemed logical they would try to take market shares to Gamestop, I just couldn’t see, considering their store or “keep it” prices, how they could offer a competitive trade-in value. 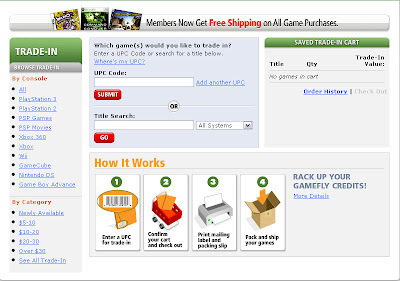 The interface on the site is pretty much what’s to be expected of Gamefly. It’s intuitive, easy to use and self explanatory. You enter the UPC code of the game you want to trade-in, you get a price quote, you then confirm your cart and check out, print your mailing label and packing slip and finally pack and ship your game. The system however massively fails on two points. 1. The trade-in value. My first attempt was with “Red Steel” for the Wii and I was offered an insulting $8.28. Just to make sure it wasn’t the exception I did some price comparison with Gamestop on other titles. I could go on and on, Gamestop offers a better trade-in value every single time. 2. Shipping and packaging costs. You’re getting free shipping on your rental and purchases but trade-ins are on you, It might not seem like a big deal but for a game like “Red Steel” shipped regular mail, it brings down the trade-in value to $6.80 and “Mario Party 8” under $17. So, although it seems like an interesting idea, I think it’s broken and I don’t see how Gamefly can fix it. Let me take that back, I know exactly how they can fix it: The only way they can resolve this, is by raising their store and “keep it” prices. I’ll be lighting a candle every day, hoping they don’t.